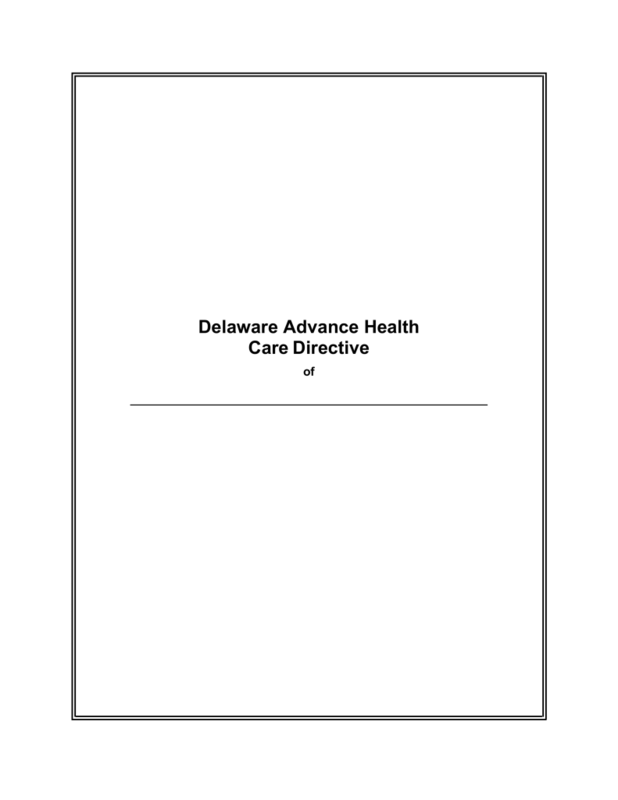 Delaware Advance Health Care Directive Form, which is a combination of a medical power of attorney and a living will, allows a person to define his or her end-of-life preferences, such as resuscitation or artificial nutrition. 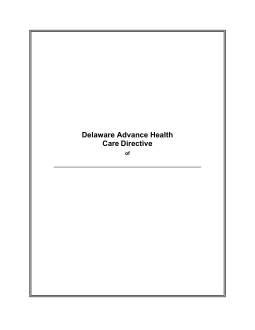 In addition to these directives, the issuing principal must name a predetermined agent to make sure such health care decisions are carried out – even when the principal is unconscious or otherwise unable to act on his or her own behalf. The document is meant to comply with 16 Del.C. §§ 2502, 2503. Durable (Financial) Power of Attorney – This form provides an individual with an opportunity to select a financial representative whose power will maintain even after the Principal becomes incompetent. Download the document, then read the instructions carefully. First, the Name of the Principal must be reported below the Form Title on the Title Page (First Page). Next, there will be several medical treatment scenarios listed that may be required for the Principal’s Terminal Condition with two corresponding blank spaces (one in each column): “I want used” and “I do not want used.” Here, the Principal will need to define what occurs in the scenarios listed. If the Principal wishes to receive Artificial Nutrition, when it is necessary, then he or she should mark the blank space in the first column. If not, the second column must be marked. If the Principal is willing to receive Artificial Hydration, if required for life, then he or she should mark the first column. If not, the blank space in the second column must be marked. If the Principal consents to Cardiopulmonary Resuscitation, the blank space in the first column must be marked. Otherwise the corresponding space in the “I do not want used” column. If the Principal is willing to receive Mechanical Respiration to breath, the blank space in the “I want used” column must be marked. If not, the blank space in “I do not want used” column should be marked. There may be other relevant scenarios to the Principal’s situations that should be considered and defined. If so, define them on the blank space after the words “Other (explain)” then mark either the first column to consent to the medical treatment defined or the second column to withhold consent. Next, locate the statement beginning with “(ii) I become permanently unconscious.” If the Principal wishes to define actions that may or may not be taken if he or she loses consciousness permanently (as in a coma), then he or she must mark the blank space provided, then define the actions that may or may not be taken with Principal consent. Similarly, if the Principal consents to receiving Artificial Fluids through a conduit to survive, then mark the blank space in the first column. If the Principal does not consent to this, then he or she must mark the blank space in the second column. If Cardiopulmonary Resuscitation may be performed with Principal consent when necessary, then mark the first column. If the Principal does not consent to receive Cardiopulmonary Resuscitation in response to a life-threatening medical event, then he or she should mark the second column. If the Principal will allow artificial Mechanical Respiration to be performed when he or she requires it for life, the first column must be marked. Otherwise, the Principal must mark the blank space in the second column to indicate he or she does not consent to such an intervention. The last selection presents an opportunity for the Principal to define any additional decisions or considerations to be made by simply writing them in on the blank line labeled “Other(explain).” The two columns may be used to define whether he or she wants the procedures defined in this selection to be used or not. If so, the first column should be marked. If not the second column should be marked. If the Principal has any additional Medical instructions, he or she should define them in Section C (“Other Medical Instructions”) utilizing the blank lines provided. The Principal must Print his or her Name at the bottom of this page on the blank space provided. The next part of this form will concern itself with the Attorney-in-Fact or Agent who will carry out the Principal’s decisions. On the first blank line after the words “I designate,” report the Full Name of the Agent or Attorney-in-Fact. On the next blank line, report an Alternate Agent that may step in and assume the Primary Agent’s role should he or she be unable to live up to the responsibilities this role entails. The next blank line will have several labeled areas: Address, City, State, and Zip Code. Report the Attorney-in-Fact’s Residential Address using this blank space. Utilize the next blank line to report the Home Phone Number and Work Phone Number of the Primary Agent. On the blank line labeled “name of individual you choose as alternate agent,” report the Name of the Alternate Agent. The line below this will have an areas designated for the Address, City, State, and Zip Code of the Alternate Agent. Finally, use the blank line in this area with the labels “Home Phone” and “Work Phone” to report the Home Phone Number and Work Phone Number of the Alternate Agent. The next three sections will contain the default language for the powers the Agent will assume. Any part of it may be crossed out by the Principal before signing. The Principal may deliver instructions concerning Anatomical Gifts after death. This section should be filled out if the Principal wishes to donate organs, tissues, and/or other body parts. If not this section may be left out and crossed out. First, the Principal should define what the nature of his or her donation is. If the Principal wishes to donate his or her body, the first box should be marked. If the Principal will donate any part of his or her body as needed, the box labeled “any needed organs or parts” should be marked. If the Principal will only donate specific parts of his or her body, the box labeled “the following organs or parts” should be marked and these body parts should be listed on the blank line provided. Next, the Principal may define where the donations are made by marking the appropriate checkbox. If the Principal will make his or her anatomical donation to the attending physician, the checkbox preceding the words “the physician…” The Principal may choose the box labeled “the hospital in which I die,” if he or she wishes to donate it to the healthcare facility handling the Principal’s medical care. The Principal may specify a recipient entity by marking the box preceding the words “the following…,” then report the name of the recipient on the blank line provided. Finally, the Principal may define for what purpose this donation can be made. The Principal should mark the checkbox preceding the appropriate purpose an Anatomical Gift may be made. The listed purposes are Any Purpose Authorized By Law, Therapy, Medical Education, Transplantation, and Research. One or all of these purposes may be selected. To the right of the Signature Date will be several blank lines requiring attention. The Principal must sign his or her Name on the first blank line on the right. Below this, the Principal’s printed Name and Address. The “Statement of Witness” section will have one conditional requirement for the language to be effective and legal. If the Principal is institutionalized, at least one witness must be an ombudsman or patient advocate. In such a case, report the name of this advocate on the blank line in Item C.
Below this statement will be two columns, each labeled “Witness.” One unique Witness must Print his or her Name, record his or her Address, then sign his or her Name. The Date of Signature must appear next to the Signature and must be the Calendar Date when the Principal performed this signing. The area labeled “Optional” will provide the attending Notary Public with an area to verify the signing and notarize the document.